Abhijit “Nannu” Nobis, of Nobis Engineering, Inc., was selected by a jury of his peers from New Hampshire’s engineering societies as the “2018 New Hampshire Engineer of the Year.” The American Council of Engineering Companies of New Hampshire (ACEC-NH) nominated Nobis based on his record of professional accomplishments, service to the profession, and contributions to the community. He received this award at the 67th Annual Engineer’s Week Banquet on February 22 at the Grappone Conference Center in Concord, NH. Having helped nominate prior awardees, Nannu was stunned to be on the receiving end this time. “They may have selected me individually but it’s really a testament to all the professionals I have had the incredible good fortune to work with everyday these past 29 years,” said Nannu. Nannu received his bachelor’s degree in Civil Engineering from the Birla Institute of Technology and Science in India. He emigrated to the United States in 1978 and earned his Master of Science in Geotechnical Engineering in 1979 from the University of Michigan at Ann Arbor. He went on to complete several executive management programs at Dartmouth’s Tuck School of Business in Hanover, New Hampshire. 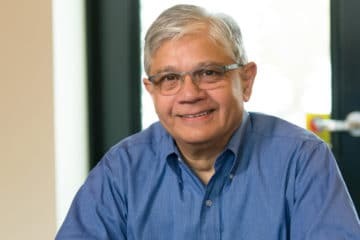 Nannu, as the founder and CEO of Nobis Engineering, developed a multi- disciplinary consulting firm with offices in Concord, New Hampshire, Lowell, Massachusetts, and Naugatuck, Connecticut. He instilled many of his personal values into the firm’s culture, including a Community Outreach Program and an employee incentive for volunteer commitments. Nannu has been a tireless member of the ACEC NH Board of Directors since the mid-1990s. His community leadership positions include serving as the current chair of Granite United Way, former chair of the Greater Concord Chamber of Commerce, a former Trustee of New Hampshire Public Radio, and a former board member of Early Learning New Hampshire. In addition to his board duties, he frequently rolls up his sleeves to help with Habitat for Humanity, New Hampshire Food Bank, and local community organizations. Nannu was recognized by the U.S. Small Business Administration as the 2012 New Hampshire Small Business Person of the Year. His firm has also received numerous awards in New Hampshire, Massachusetts, and nationally.